HOUSTON (AP) — The Houston Texans wanted to honor their late owner and founder Robert “Bob” McNair, who died last week at age 81. They knew the perfect way to do that Monday night was to keep their winning streak going. 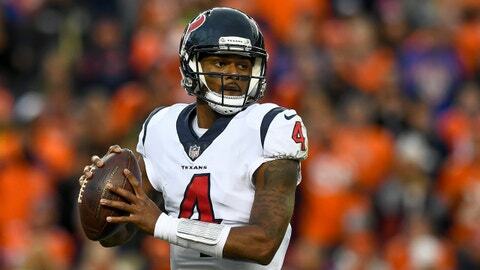 Deshaun Watson threw two touchdown passes and ran for another score as the Texans set a franchise record with their eighth straight victory, 34-17 over the Tennessee Titans. Demaryius Thomas scored his first two touchdowns with Houston and Lamar Miller ran for 162 yards, including a 97-yard TD. The Texans (8-3) also saluted McNair by wearing decals in the shape of a football with white block letters bearing his initials of “RCM.” With that tribute on the back of their helmets, they became the first team in NFL history to win eight games in a row after starting 0-3. They lead the AFC South by two games over Indianapolis. The Texans trailed by 10 early before reeling off 27 straight points. Houston receiver DeAndre Hopkins said there was no panic after the team fell behind in the first quarter. “We’ve been down 0-3 as a record, so being down 10-0 on the board is nothing to this team,” he said. Tennessee (5-6) finally scored again on a 48-yard reception by Corey Davis late in the third quarter, but the second TD by Thomas — this one for 10 yards — made it 34-17 with just more than eight minutes left. Marcus Mariota, who missed the second half of last week’s game with a stinger, was 22 of 23 for 303 yards and two touchdowns. He completed his first 19 passes before an incompletion with just more than a minute remaining. Miller’s 97-yard breakaway in the second quarter made it 21-10. It was the longest run in franchise history and the longest in the NFL since his dash of the same length for a touchdown on Dec. 28, 2014, with the Dolphins. He’s the only player in league history with two career rushing touchdowns of 95 yards or longer. Miller’s long TD , which helped Houston set a franchise record with 281 yards rushing, came on the next play. He took the handoff in the end zone and darted through a crowd of Titans before shedding one tackle and simply outrunning the rest of the defense. Watson has thrown 39 touchdown passes in his first 18 career games, which is third in NFL history behind Hall of Famers Kurt Warner (44) and Dan Marino (40). His 70 yards rushing on Monday were a career best and he tied Matt Schaub’s franchise record by throwing a TD pass in his 16th straight game.